Good evening. I am delighted to join you tonight in celebration of the 20th anniversary of the Hong Kong International Airport which we are so proud of. Your timing is certainly on the mark. It was 20 years ago this very day that Cathay Pacific flight CX889, from New York, became the first commercial service to touch down at our brand-new airport. That was the beginning of our steep climb, our rise and shine as one of the world’s major aviation hubs. The numbers certainly bear that out. In 1997, its last full year of service, Kai Tak Airport handled 10.2 million passengers. Last year, Hong Kong International Airport, or Chek Lap Kok, welcomed some 73 million passengers and more than five million tonnes of air cargo. That makes us the world's third-busiest international passenger airport. It also makes us the world’s busiest cargo airport – and that for the past eight years in a row. We've become just as popular with the world's airlines. Indeed, the number of airlines with operations here has grown from 60 to more than one hundred, providing over 1,100 flights a day to more than 220 destinations around the world. Such results have not gone unnoticed. Over the past two decades, the airport has been honoured with more than 70 "best airport" awards. And the best is yet to come. Construction of the airport’s three-runway system has been in place for nearly two years now, with completion scheduled for 2024. At that point, the airport will be able to welcome about 100 million passengers a year while handling some nine million tonnes of cargo annually. This timing should be fortuitous, given the vast promise of the Guangdong-Hong Kong-Macao Bay Area, with its collective population of over 69 million busy, prosperous people. The imminent completion of the Hong Kong-Zhuhai-Macao Bridge and the Hong Kong section of the Guangzhou-Shenzhen-Hong Kong Express Rail Link will slash travelling time between Hong Kong and Guangdong as well as Macao, making our airport even more accessible. The major Pearl River Delta airports are also expanding to cater to the expected soaring of demand, but I am confident that our integrated multi-modal infrastructure – embracing air, sea and land – will ensure that Hong Kong remains the Bay Area’s international transport hub. More than moving people and cargo around the region and the world, our airport will fly on sustainable talent. In that regard, I'm pleased to note that the Airport Authority and France’s Groupe ADP last month signed two MOUs. These will boost co-operation between Hong Kong International Airport and Paris Charles de Gaulle Airport, one of the world's busiest airports. These agreements cover a variety of areas, ranging from airport management to talent development, including a staff exchange programme. I'm pleased as well that our International Aviation Academy and the Vocational Training Council also signed an agreement last month. Together, they will work to expand our local talent base, training tomorrow's professionals to support the airport's long-term development. Going further, the Academy will also offer training and exchange opportunities to our friends along the Belt and Road, sharing Hong Kong's rich experience in aviation and strengthening people to people bonds. Ladies and gentlemen, the Hong Kong International Airport is among our most important infrastructure. And the AA Board, under the able leadership of Jack, and the management led by Fred are to be commended for leveraging on the strengths of our airport with two major initiatives launched earlier this year, namely the SkyCity, a 25-hectare integrated development right next to the airport comprising retail complexes, dining areas, hotels, entertainment facilities and offices; and a major air logistics centre which, scheduled to commence operation in 2023, will become the smart hub in Asia serving the fast-growing global e-commerce business. 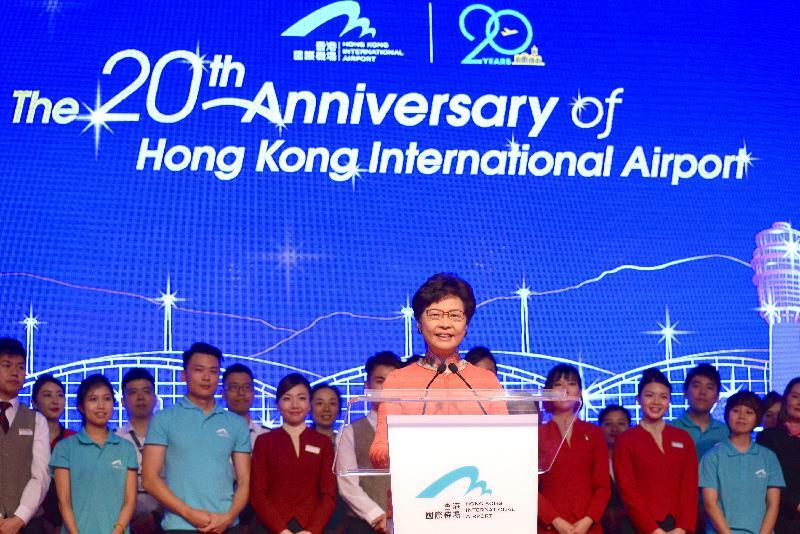 So my heartfelt congratulations to Hong Kong International Airport on its 20th anniversary, and I wish it all the best in the next 20 years. I also wish everyone here tonight a very enjoyable evening.